La Mom - an American mom in Paris: It's Story Time! 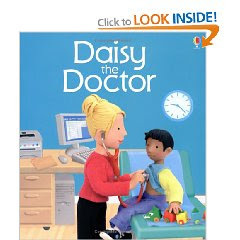 The French Fries have a very politically correct book called Daisy the Doctor. It's about a female doctor in England who has co-workers and patients representing all the colors in a rainbow. As I was reading it, it struck me how I've never seen a book like this in France and probably never will. So what would the French version of Daisy the Doctor be like if it existed? Let's get ready to have STORY TIME WITH LA MOM and find out! See if you can spot the differences between the English & French versions. Pierre the(male)Doctor would drive to work in a Citroen, not a Mini. The waiting room is packed when Pierre arrives. "Good morning," says Sylvie cheerfully. Pierre's first patient arrives. His name is Mustapha Ben Amara. "Poor little Mustapha's been up all night with an earache," says his maman Hakima. "Big owie!" cries Mustapha. Next, in comes a maman with Medina bin Abdullah,a tiny baby, and a small boy called Farid. Medina bin Abdullah's doing just fine," says Pierre. Just then, Sylvie knocks and opens the door. "Someone's had an accident," she says. (Sidebar: Warning: La Mom is going to vent. Alexandre stops crying. Moleka the female nurse treats the cut. Pierre the Doctor is running late and has a lot more patients to see. (Sidebar: See how the English patients represent different ethnicities and colors? They'd all be lilly white with names like Faustine, Dauphine, Jean-Louis & Charles-Antoine in the French version). At last it's time to go home. "I'm exhausted and have a headache," says Pierre the Doctor to Sylvie. "Maybe you should see a doctor!" says Sylvie as she rolls her wheelchair out of the office and into the handicap friendly world of Paris, down 100 steps of the apartment building, down 200 steps to the metro station, on her way home from work. Here are some New York Times links that show another side of France. Liberté, Egalité, Fraternité? Not exactly. I agree with SH. You should submit it for publishing! Your honesty is appreciated and it is all true. My hubby and I were recipients of many different forms of prejudice and racism while living there. Although the country is beautifully diverse, they seem to still be stuck in the 18th century. I love that the baby is titled: Big Bald Baby. I don't know why that humors me so.